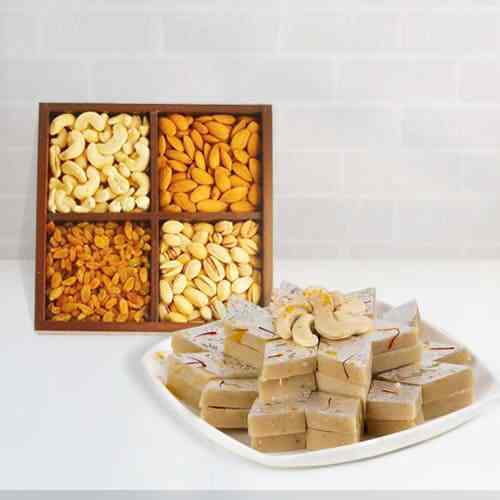 Assorted Dry fruits with Haldiram Kaju Katli. Send this sumptuous array of Assorted Dry Fruits (250 gms (Gross Weight)) containing cashew and raisins along with delicious Haldiram Kaju Katli (250 gms (Gross Weight)) to your near and dear ones. Assorted Dry fruits with Haldiram Kaju Katli. Send this sumptuous array of Assorted Dry Fruits (500 gms (Gross Weight)) containing almonds, apricots, cashew and raisins along with delicious Haldiram Kaju Katli (500 gms (Gross Weight)) to your near and dear ones. Assorted Dry fruits with Haldiram Kaju Katli. Send this sumptuous array of Assorted Dry Fruits (1 kg. (Gross Weight)) containing almonds, apricots, cashew and raisins along with delicious Haldiram Kaju Katli (500 gms (Gross Weight)) to your near and dear ones.